Sunlike stars - Solar System Planets And Moons Section. 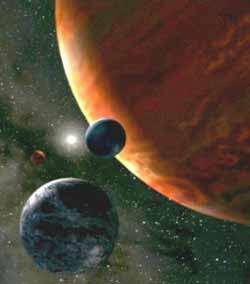 Earthlike planets begins with the search for sunlike stars. The search for Earthlike planets begins with the search for Sunlike stars. Radio Silence with the Beagle 2 lander. Controllers initiated a state of radio silence with the Beagle 2 lander after it failed to report in, or communicate through Mars Express. In theory this radio silence should force Beagle 2 to enter into "Communication Mode 2", where it attempts to call out constantly throughout the Martian day. The best opportunities to make contact with the lander will happen on the nights of January 24/25 when Mars Express passes over a significant portion of the landing area. Selecting Stars Very Similar to our own Sun. The search for Earthlike planets begins with the search for Sunlike stars. At the top of the list is a reasonably nearby star called 37 Gem; located in the Gemini constellation. Astronomer Maggie Turnbull was asked to make a short list of thirty candidate stars that closely matched our own Sun out of a total list 2,350 stars which are within one hundred light years from us. This short list, including 37 Gem will be used by the Terrestrial planet Finder mission, which will search for habitable planets by looking for the visible light of oxygen or water in an Earthlike planet - a sure sign of life. Spirit Rover Reaches Out to Adirondack. Spirit is reaching out to test the nearby rock, "Adirondack", which controllers targeted to get a better understanding of its composition and origin; it will be performing a series of tests today and tonight. The rover already used its instruments to examine a patch of soil near the lander and found some surprising results: the soil in Gusev Crater seems volcanic in origin, not sedimentary. Its instruments have also found the presence of a mineral called olivine, which doesn't resist weathering very well and is normally evidence of volcanic deposits.